This is the morning view to the west from our access track alongside the house a couple of weeks ago. The sun was coming through a break in a huge fog bank to the east. The msit is lying in the valley of Lilydale Creek and its tributaries. Our western boundary runs along the top of the first ridge (with the light on it). 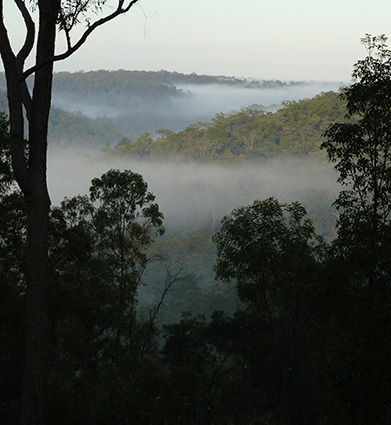 Beyond that is all Lockyer National Park – around 9,000 hectares of it, and no fence between us and the Park. In that direction there isn’t another house for maybe 10 km. We heard a Koala calling from somewhere down in the first gully (below the dark foreground trees) a couple of nights ago. For those who have seen the Helidon Hills Smokespotters web site, the smoke in the page title photo on that site was from a large bushfire that had just crossed into this catchment at the top right of this photo. Twenty-nine species of birds this month. As usual, probably nowhere near the total that were somewhere on the block, but unless we have time get down into the gullies regularly there must be a lot of species that we miss. Funny how the count is generally in the high twenties, even though the actual species recorded varies from month to month. 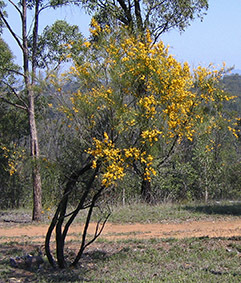 There are the “stayers”, such as the Buff-rumped Thornbills, White-throated Honeyeaters, Eastern Whipbirds, Pied Currawongs and Rainbow Bee-eaters to name just a few. However I suspect that even among some of these, it isn’t the same birds staying throughout the year. For instance, even though the White-throated Honeyeaters are seen in every month, in some months there are birds present which clearly have broader white band around their nape than the usual individuals. A migratory sub-species? Apart from the arrival of the Channel-billed Cuckoos (or to be precise, the first calls for the season – they may have arrived earlier and just not been calling), there were a few other highlights. 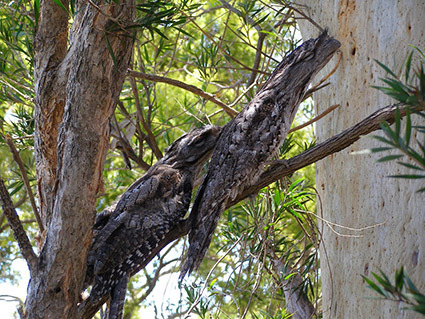 The first territorial challenge calls of the Tawny Frogmouths for the season, for instance. This call had me baffled for years. It’s a very low-pitched, “pumping”, oom-oom sound. So low-pitched that sometimes I think that I feel it more than hear it. I couldn’t find a description of the call anywhere and no one I described the call to could come up with a reliable identification of the species. Then a few months ago our friends Richard and Kathryn Johnson were here and I played a recording of the call to them. They burst our laughing. Richard and Kathryn have lived with Ed, a flightless Tawny Frogmouth for more than 30 years, since he came to them as part of Kathryn’s wildlife rescue and recovery work in Townsville. Apparently Ed’s presence in wild Tawny Frogmouth territory elicits territorial calling duels with exactly this call – sometimes with the wild bird standing on top of Ed’s cage and both of them calling at top volume. Now that we know what the call is we can actually “census” the Frogmouth territories in our neighbourhood, because once one starts up the birds with neighbouring territories will start calling too. This kind of very low frequency sound carries for a long distance on the night air. By the end of September the Eastern Yellow Robins weren’t coming around the garden nearly as often as they did in August. We’d see them perced sideways on trunks in lookout-mode, or working their way through the foliage in search of insects, but now we generally only hear them in the dawn chorus and they are probably spending their days in the (slightly) damper gullies. We didn’t see any Jacky Winters this month, though our records show that they can be seen here in most months and they were very common in August. We recorded six species of wildflowers this month. 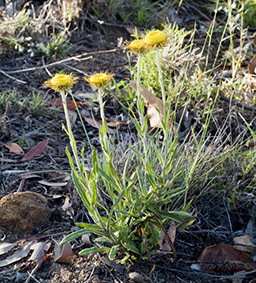 Nowhere near the total that were flowering on our block, but we have been just too busy to get around all corners of the bush, and when we were out and about there just wasn’t time to make a note of what was flowering. Certainly, though it’s now officially Spring, the number of flowering species was way fewer than in August. The noteworthy species were the Dogwood (Jacksonia scoparia) and a kind of everlasting daisy (Coronidium oxylepis subspecies lanatum). The Dogwood has flowered prolifically this year, and it’s only at this time of year that the sheer numbers of this understorey species become apparent. In angled sunlight their flowers light up the shadows in the bush like yellow fairy-lights. When they come up in the “lawns” around the buildings we generally leave them because of the wonderful spectacle they make when they flower. We hadn’t realised until this year that the Red-necked Wallabies eat the flowers of this species, reaching up with their front paws to pull a flowering branch down within reach of their mouths. Steve and Alison Pearson, in their book Plants of Central Queensland, say that the aborigines collected pollen from the flowers. The name Dogwood comes from the smell of the smoke when this plant is burned green. You’d think someone nearby had stepped in something nasty. Though they don’t burn readily when growing scattered in the bush, a heap of recently cleared Dogwood burns fast and very hot. I’ve got the burn scars to prove it. The everlasting daisy we have here doesn’t seem to have a common name, though I have seen it referred to once as the Woolly Pointed Everlasting, which seems to be a compilation of its main features rather than a real common name. Until recently its Latin name was Helichrysum collinum. The last few years have seen an amazing population explosion of this species in the groundcover of the drier ridges on our place. At this time of year they are very popular with a wide range of insects, butterflies and skippers. In our part of the Helidon Hills the flowers of this species have a crown of brown/golden pointed bracts surrounding the flower, but in more northerly areas in the Hills I’ve seen them with silver bracts. Maybe a different sub-species?